Trust is essential when you only have two weeks of vacation. Hotels can be hit or miss, and a "miss" can completely derail your entire holiday. For peace of mind that the property you'll be staying at comes as advertised, we've found sticking with tried and true hotel chains is helpful. You'll also be able to take advantage of loyalty programs and exclusive benefits. 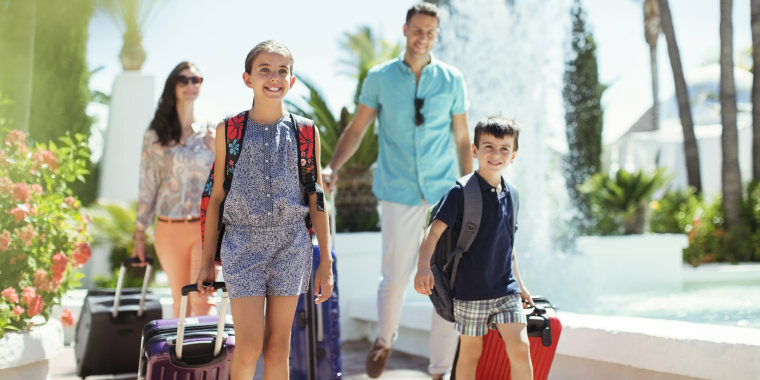 Whether you're booking a beach escape or that bucket list trip you want to take with the kids before they're grown, here are the brand names, from The Ritz-Carlton to Red Roof Inn, you should know. Marriott describes its impressive portfolio as the "most powerful in the industry." With nearly 7,000 properties in 130 countries and territories, it certainly is one of the biggest. (Wyndham Hotels boasts nearly 9,000). For travelers, a hospitality company of this size equates to unrivaled perks and opportunities to redeem them. For example, Marriott's recently rebranded loyalty program, Marriott Bonvoy, is the largest loyalty program in the world. Points are recognized by 29 different brands including Fairfield Inn & Suites, Aloft, W Hotels and even the boutique Autograph Collection. Usually strategically located in city centers or across from airports, Sheraton is the home away from home for many business travelers. But Marriott's oldest and most global brand also has plenty of family-friendly resorts in its portfolio of 450 hotels spread throughout more than 70 countries and territories. After being acquired by Marriott in 2016, it's also been hard at work adding more immersive experiences inspired by the hotel's destination. For example, Sheraton's 2018 Heart for the City initiative featured on-site "Instagrammable experiences" allowing guests to rack up the likes even before heading out to explore. The Ritz-Carlton is the Rolls Royce of luxury hotel brands. With its original iconic properties in Paris, New York and London, it set the bar for five-star service. In terms of industry awards, the company says it "has received all the major awards the hospitality industry and leading consumer organizations can bestow." Today, the brand's portfolio includes 97 hotels and resorts in 30 countries. While its properties' rates aren't as low as they once were (in 1927, you could stay at Boston's Ritz-Carlton for $15/night), they're not as extravagant as one may think. For example, a one-night stay in April at The Ritz-Carlton Abama — a Spanish beachfront resort with two Michelin-star restaurants on site — is only $215. That rate includes a buffet breakfast and WiFi. Westin Hotels & Resorts, another Marriott brand, is the best chain if you're looking to stay healthy while traveling. Wellness forms the foundation for Westin's guest experience. For example, it boasts a gear-lending program so guests can borrow workout shoes and apparel, in their size, from the hotel. Guests even get to keep the socks! In addition to its partnership with New Balance, Westin partners with Peloton and TRX to offer guests access to state of the art equipment in its WestinWORKOUT Fitness Studios. Westin's 268 properties can be found on six continents and in more than 40 countries. Already in 2019, Hyatt Hotels Corporation has landed on three prestigious Forbes and Fortune lists: America's Best Employers for Diversity, 100 Best Companies to Work For and 2019 World's Most Admired Companies. Happy employees often equal happy guests, and Hyatt is constantly striving to outdo itself. Recently, it expanded its partnership with American Airlines. Guests can earn miles for dollars spent on hotel stays and dollars for miles traveled on American Airlines. Headquartered in Chicago, the company's portfolio of 19 premier brands has more than 850 properties. They're spread out over six continents and 60 countries. Hilton, a household name for most Americans, celebrates 100 years in 2019. What started as one hotel in Texas has turned into nearly 600 properties on all six hospitable continents. Its parent company, Hilton Worldwide, has an additional 5,000 properties under brands like Embassy Suites by Hilton, Waldorf Astoria Hotels & Resorts and DoubleTree by Hilton. Regardless of which brand you stay at, sign up for Hilton Honors. It's free and includes perks like late check out and members-only discounts. This game-changing loyalty program also lets guests spend points by bidding on exclusive experiences like attending a private Kesha concert, taking a chauffeured tour in a Porsche or riding in a hot air balloon over Milan. If your travels take you across the pond, consider this Spanish chain Europeans find synonymous with value and quality. Although Iberostar specializes in four-star and five-star properties, it's hard to pay more than $250 for a room — and that's for the nicest suite with an ocean view and all meals included at a five-star resort. Iberostar's more than 120 properties are spread out throughout Europe, Africa and the Caribbean. Nine of its properties were recently recognized by Delta Vacations (Delta Airline's parent company) for achieving 99% of customer satisfaction and 99% product performance. This award-winning hotel group with 250 properties in 22 countries knows the art of the all-inclusive. It's had nearly 80 years of practice and prides itself on elevated buffet cuisine and adults-only elements. For example, chefs at Barceló Santiago in the Canary Islands, cook guests' proteins and pastas, made to order. In addition to three family-friendly pools, its spa has a hydrotherapy circuit for the more serious, stressed-out crowd. In 2016, Barceló acquired Occidental Hotels & Resorts and invested more than $120 million into its Latin America and Caribbean properties. Its biggest property, Barcelo Maya Grand Resort, is actually now five different resorts in one! Red Roof Inn likes to advertise "you stay happy, pets stay free." All but two of Red Roof Inn's 550 properties — in the US, Brazil and Japan — welcome pets. (All of its locations welcome service animals.) In addition to being the most pet-friendly chain, it's also always been one of the most economical. In 1973 when the first RedRoof Inn opened, in Columbus, Ohio, the nightly rate was about $9. Today, a room at Red Roof Inn Columbus starts at just $58. Note: if you don't like the idea of having your room door open directly to the outside, this might not be the chain for you. When cookie cutter hotels won't cut it, consider this rapidly growing group showcasing the world's most unique, independent properties. Its 535 members are "personally visited, vetted and verified" boutique hotels located in 81 countries. Whether you want a romantic ranch escape in Wyoming, a contemporary room with a private terrace in Tel Aviv or a historic train station hotel in the heart of Tokyo, Small Luxury Hotels of the World is the place to start. Small Luxury Hotels also recently launched a partnership with Hyatt. World of Hyatt members can now enjoy some of their loyalty benefits at select SLH properties.